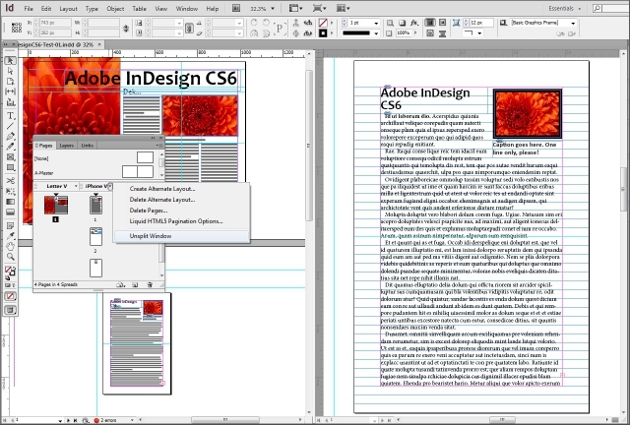 Adobe InDesign CS4 software breaks down the barriers between online and offline publishing. Create compelling print layouts, immersive content for playback in the Adobe Flash Player runtime, and interactive PDF documents. Get Adobe InDesign and take it for a spin to see what it can do for you! • Find and fix production errors twice as fast: Catch production errors as you design with real-time preflighting. Instead of flagging them at the end of the design process, Live Preflight alerts you to errors as they arise so you can quickly find them, fix them, and move on. • Navigate links more quickly with intuitive access and greater control: Find, sort, manage, and organize placed files with a redesigned and more powerful Links panel. Thumbnails, customizable views, and easier access to more attributes make it much easier to stay on top of all your linked assets. • Position, scale, and align objects in half the time: Align, space, rotate, and resize single or multiple objects faster with the help of dynamic new Smart Guides. The guides, object dimensions, rotation angles, and x and y coordinates appear dynamically to help speed up desired object positioning. • Save time by placing images proportionately: Place images more efficiently with automatic fitting. Images are scaled automatically to fit their frames' proportions. Or, override the scaling with a fitting option preset. • Create and manage one file instead of many with conditional text: Build variants of manuals, student/teacher textbook editions, or multilanguage publications within a single Adobe InDesign file. Quickly create and apply conditions to specific text, and then hide and show the text as needed without relying on layers. Text and anchored objects reflow automatically. • Add document pages automatically with Smart Text Reflow: Add text without interrupting your creative process, thanks to automatic addition of pages at the end of a story, selection, or document when text is overset. • Automate cross-references: Streamline production with cross-references that update when you change content or rearrange text within a document. • Edit tables in the Story Editor: Edit tables directly within the Story Editor. Editing your table content directly within the text flow allows you to quickly correct overset text without affecting the table design. • Liquid Layout: Apply liquid page rules to automatically adapt content when you create an alternate layout with a different size or orientation in InDesign. • Alternate Layout: Efficiently create and design multiple versions of a layout for different devices and print needs, all within a single InDesign file. • Linked content: Link content within or across InDesign documents so that changes (including interactivity) made to the parent text or object are applied to all linked children objects. • Content Collector tools: Grab text and objects from an existing layout using the Content Collector. In a new layout, use the Content Placer to add items in the order you want them to appear. • PDF forms within InDesign: Create form fields directly within InDesign before you export to PDF. You can also assign the tab order in InDesign using the Articles panel. • Middle Eastern language support: Buy and update the Middle Eastern version of InDesign directly from Adobe for easier localization of global documents and enhanced functionality. • Pages panel enhancements: Display alternate layouts in the Pages panel to organize content efficiently. • Split window: View two side-by-side layouts within the same document to compare the look and feel of the layouts and help ensure consistency. • Recently used fonts: Access fonts you use frequently. Recently used fonts appear at the top of the font list. • Persistent text frame fitting options: Set frames to grow with additional text, based on simple parameters. Expand and shrink frames automatically for headlines, callouts, or other variable content. • Grayscale preview: Preview your layouts in grayscale to see how they will look on a black-and-white device or when printed in black and white. • Grayscale PDF export: Export PDF files in grayscale directly from the Print dialog box. • Key object alignment: Align selected items to a key object you define. • Hunspell dictionary enhancements: Access more than 100 open source dictionaries. • IDML support: Save in IDML format from the Save As menu to use the layout in an earlier version of InDesign. • Complex calculations: Calculate values in panels and dialog boxes using complex calculations (for example, 12.5p/2x3). • Enhanced split and span support: Keep lines together in paragraphs that split or span columns. • Interactive PDF exported as pages: Export an interactive PDF as pages instead of spreads. • Export to PNG: Export your InDesign document to PNG, a lossless format, for use on the web. You can export the entire document, part of the document, or individual items. • Enhanced zoom for linked objects: Zoom in to a linked object from the Links panel to evaluate it more clearly. • Extension set management: Enable or disable groups of extensions based on your current workflow. • Indic language support: Use the World-Ready Composer, an alternate composition engine, to work with Hindi, Punjabi, and other Indian languages, as well as complex script languages such as Arabic and Hebrew. • Interactive HTML: Include interactive HTML — such as Google Maps and animation developed with Adobe Edge software — in InDesign layouts. Interactivity is retained when exporting to HTML, EPUB3, or .folio for Adobe Digital Publishing Suite. • Style mapping in linked text: Control how content in linked text is styled. Specify different text styles for parent text and children. • Enhanced packaging support: Package InDesign projects for handoff in Adobe Digital Publishing Suite workflows, including functionality such as overlays. You can also include an IDML file as part of the package.